Sharjah Art Foundation works on a range of core initiatives and programmes that include the Sharjah Biennial, the March Meeting, Education Programmes, Production Grants, Residencies and a range of Community projects. 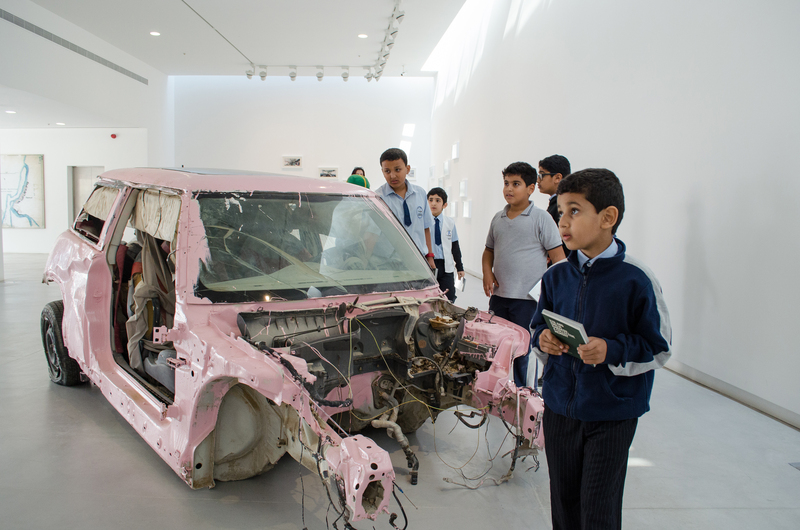 Children touring an exhibition of works from the Sharjah Art Foundation Collection, on view is Sarah Abu Abdallah’s Saudi Automobile, 2011 which was included in Sharjah Biennial 11. 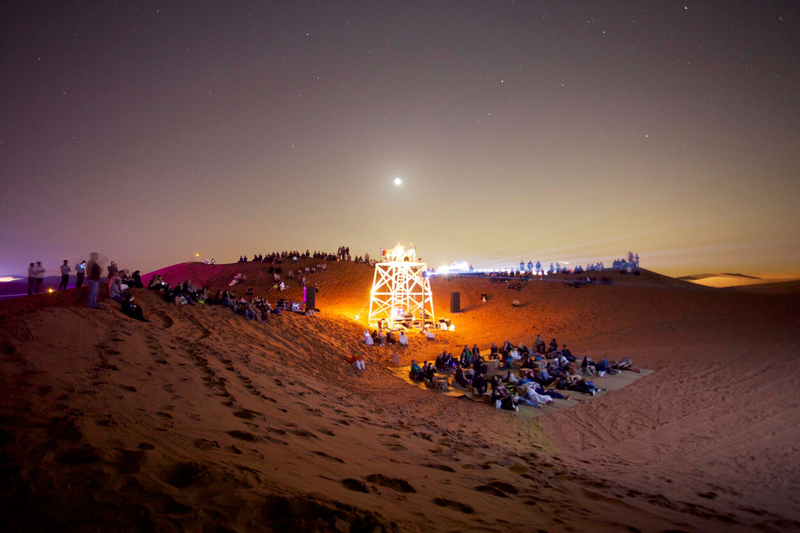 Part of March Meeting 2016 Week, artists Taro Shinoda and Uriel Barthélémi presented Lunar Reflection Transmission Technique in the Mleiha desert. Sharjah Art Foundation works on a range of core initiatives, projects and programmes that reflect the history of the Biennial and respond to the needs of diverse local and regional communities. Sharjah Art Foundation core initiatives include the Sharjah Biennial, the annual March Meeting, year-round exhibitions, and a range of programmes that focus on areas such as education, film, music, community outreach as well as artists’ and professional development. SAF also maintains a growing collection that includes works commissioned and produced by the Foundation, works supported by SAF production and residency grants and works by artists related to our exhibition programme. Events take place in Sharjah Art Foundation Art Spaces as well as in a number of traditional buildings and courtyards, including Sharjah’s only outdoor cinema. •All SAF exhibitions, events and programmes are open to the public and free of charge. Every two years Sharjah Biennial brings together artists from around the world in the UAE’s longest running contemporary art event. Since 1993, Sharjah has been host to the internationally recognised Sharjah Biennial. Originally organised by the Sharjah Department of Culture and Information, the Biennial followed a traditional format featuring the work of artists chosen to officially represent each participating country. In 2003 the Biennial shifted towards a more curatorial model as Hoor Al Qasimi became co-curator of Sharjah Biennial 6 alongside Peter Lewis. Titled Art in a Changing Horizon: Globalisation and New Aesthetic Practice, the Biennial included 117 artists from 25 countries. The Bienniel Prize was awarded to Rashid Masharawi, Jim Coverly, Mohammed Kazem and William Kentridge. Continuing as Director of the Sharjah Biennial, Al Qasimi selected a curatorial team for the 2005 Sharjah Biennial 7 that included Jack Persekian, Ken Lum and Tirdad Zolghadr. Approximately 70 artists were included in this Biennial titled Belonging. For the first time, the Biennial moved away from exclusively using the Sharjah Expo Centre to presenting works in the Sharjah Art Museum and other spaces within the Art and Heritage Areas of the city. Three Biennial Prizes were awarded to artists Mario Rizzi, Maja Bajevic and Moataz Nasr by a jury comprising Walid Sadek, Rina Carvajal and Okwui Enwezor. Still Life: Art, Ecology and the Politics of Change was the title of Sharjah Biennial 8, which opened on 4 April 2007. Co-curated by Mohammed Kazem, Eva Scharrer and Jonathan Watkins, the Biennial also featured a film programme curated by Mark Nash. Once again the Biennial took place in venues that included the Sharjah Art Museum, Expo Centre Sharjah and locations within the Arts and Heritage Areas of the old city. The Biennial included approximately 80 newly commissioned works. Biennial Prize jurors Negar Azimi, Charles Esche and Geeta Kapur gave awards to Michael Rakowitzand Amal Kenawy. In association with Sharjah Biennial 8 UNESCO awarded a Prize for the Promotion of the Arts, to Lida Abdul and Lara Almarcegui. Provisions for the Future curated by Isabel Carlos and a film and performance programme Past of the Coming Days curated by Tarek Abou El Fetouh. The Biennial announced an Open Call for proposals from artists for site-specific works that would use a range of locations within the city. 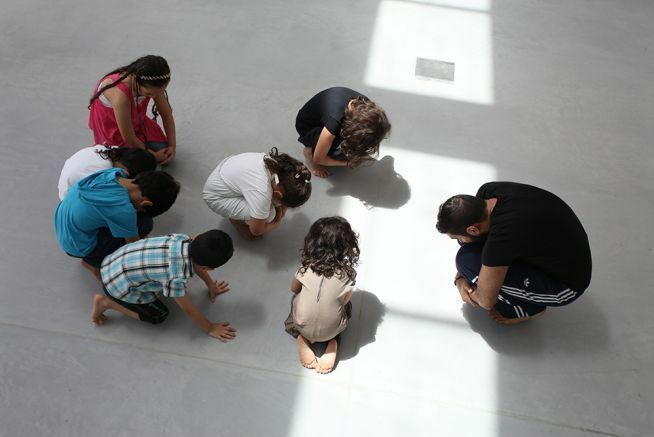 The Open Call marked the start of what are now Sharjah Art Foundation’s ongoing Production and Residency Programmes. More than 90 artists were included in this Biennial that opened on 18 March 2009. The Sharjah Biennial Prizes were awarded to CAMP, Hamra Abbas, Basma Al Sharif, Haris Epaminonda and Maha Maamoun by a jury comprised of curator Paolo Colombo, Salah Hassan and Ute Meta Bauer. This Biennial also hosted the first March Meeting. In 2011 Sharjah Biennial 10: Plot for a Biennial was curated by Suzanne Cotter and Rasha Salti with Associate Curator Haig Aivazian. Marking the 10th anniversary of the Biennial, it took place in the Arts and Heritage areas of the city as well as the city streets and the Sharjah Cricket Stadium. More than 65 new commissions were created by more than 119 artists from 36 countries. In addition to the exhibition programme Plot for a Biennial included a Commissioned Film Programme, a curated Film Programme, a Music Programme and a Performance Programme. The Sharjah Biennial 10 Prize was awarded to Trisha Donnelly, Imran Qureshi, Rania Stephan, Rayyane Tabet and Jalal Toufic by a jury comprised of Klaus Biesenbach, Director of MoMA PS1, New York; Christine Tohme, Director of Ashkal Alwan, Beirut; and Boris Groys, art critic, media theorist and Andrew Mellon Professor at the Courtauld Art Institute, London. Sharjah Biennial 12: The past, the present, the possible invited more than 50 artists from over 25 countries to introduce their ideas of the possible through their art and work. Curated by Eungie Joo, previously Director and Curator of Education and Public Programs at the New Museum of Contemporary Art, New York, and Associate Curator Ryan Inouye, Sharjah Biennial 12 took place in Sharjah, crossing the Emirate to sites in and around the city as well as in the city of Kalba on the Gulf of Oman. SB12 features new work and commissions by thirty-six artists and groups. Receiving the Sharjah Biennial 12 Prize were artists Eric Baudelaire, Asunción Molinos Gordo and Basel Abbas and Ruanne Abou-Rahme. Artists Adrián Villar Rojas and Fahrelnissa Zeid were also honoured for their thought-provoking contributions to the Biennial. The 2015 Prize jurors were Suha Shoman, Founder and Chair of Darat al Funun – The Khalid Shoman Foundation, Amman, Jordan; Koyo Kouoh, Founding Artistic Director of RAW Material Company, Daka, Senegal and Park Chang-Kyong, artist, filmmaker and artistic director of MediaCity Seoul 2014, Korea. • Further information and artists list for past Sharjah Biennials can be found here. The March Meeting is an annual gathering of global art professionals and institutions concerned with the production and dissemination of art in the region. Launched in 2008, the Meeting was conceived as a forum to encourage regional art professionals to connect, to share ideas and expertise, to network and form partnerships for future projects. Each year the March Meeting changes to reflect the issues and concerns of both the Foundation and its communities. The first March Meeting was organised in cooperation with the Young Arab Theatre Fund(YATF). Discussions covered a wide range of topics including the enhancement of funding opportunities for artists and the need to address issues related to Arabic art writing and publishing. Among those attending were representatives from influential regional institutions including Darat Al Funun (Jordan), Townhouse Gallery (Egypt) and Beirut Art Center (Lebanon). Reflecting the broad international attendance of the 9th Sharjah Biennial, the 2009 March Meeting added a more global perspective to the regional discussion. Complementing presentations by regional organisations such as the Beirut-based Ashkal Alwan, were those given by prominent international figures such as Rem Koolhaas, Thomas Krens and institutions such as the Prince Claus Foundation, as well as universities from New York and Sharjah. The 2010 Meeting was co-organised with New York based ArteEast. Over fifty art institutions based or active in the MENASA region, as well as artists and independent curators took part in the three-day symposium. Funding was provided to those presenting thus enabling a wider range of organisations and individuals to participate. The programme allowed participants to present projects, ideas, dilemmas and plans, with a view to developing a strong foundation for future collaborative ventures as well as mapping the cultural calendar for the coming years. Keynote presentations were given by Abdelfattah Kilito and Okwui Enwezor, while organisations and artists presenting included Contemporary Image Collective (Beirut), Al Riwaq (Bahrain), Townhouse (Cairo) and Khoj (New Delhi), Adel Abidin, Basma Al Sharif and Bushra Khalili. In 2011 the March Meeting followed a similar approach by offering a platform for discussion around current and future projects. Presenters included Wael Shawky, Georges Rabbath and Ousaama Rifahi. The theme Working with Artists and Audiences on Commissions and Residencies was chosen for the 2012 March Meeting that explored the present realities, future outlook and dynamics between artists and institutions in the context of artistic commissions and residencies. Speakers included Dr. Salah Hassan, Jude Kelly, Beatrix Ruf, Dr. Salwa Mikdadi and William Wells. For March Meeting 2013 speakers were invited to reflect on and contextualise the concepts addressed by the curatorial theme of Sharjah Biennial 11 Re:emerge – Towards a New Cultural Cartography. Speakers included Sarat Maharaj, Professor of Visual Art and Knowledge Systems, Lund University and the Malmö Art Academies, Sweden, Paulo Herkenhoff, Director, Museu de Arte do Rio (MAR), Brazil, Hu Fang, Artistic Director, Vitamin Creative Space, China and Patrick D. Flores, Curator, Vargas Museum, Philippines. A selection of additional speakers were chosen from applications submitted in response to the MM 2013 Open Call for presentations. 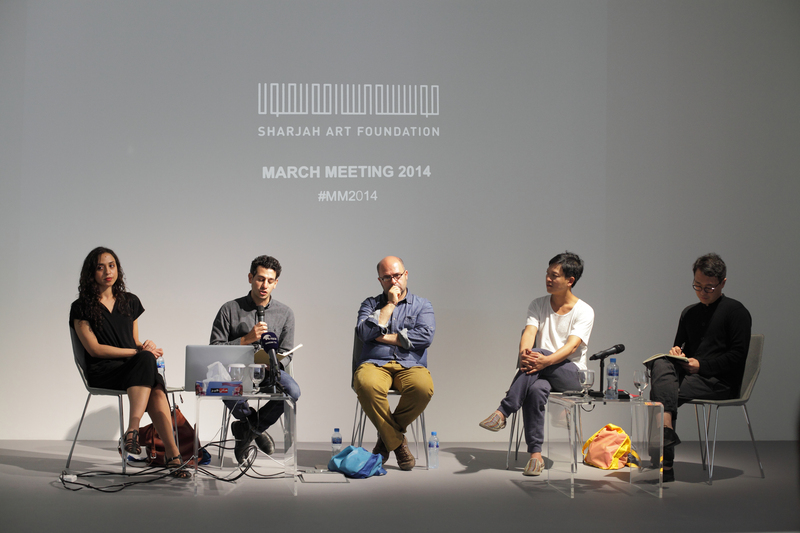 Organised by Sharjah Biennial 12 curator Eungie Joo, March Meeting 2014: Come Together was conceived as a point of departure for the next Biennial, incorporating commissioned artists to shape a context for their as yet unimagined projects. In addition to presentations, MM 2014 featured case studies, collective research and evaluation sessions, and moderated, informal discussions at the end of each day, to promote the active participation of all in attendance. The Open Call for March Meeting 2014, was for correspondents who would contribute a response to the Meetings themselves. March Meeting 2015 was part of an extended conversation that began with March Meeting 2014 and continued through Sharjah Biennial 12. For this edition, SB12 curator Eungie Joo invited Kristine Khouri and Rasha Salti, Eric Baudelaire and Ayreen Anastas and Rene Gabri to conceptualise different sections of MM2015 as integral parts of their contributions to SB12. MM2015 included panel discussions, keynote addresses, talks and screenings pertaining to the respective programmes’ conceptual concerns. • For further information please visit the March Meeting pages here. • For information about March Meeting publications visit here. Here you will find general information about ongoing SAF Programmes and initiatives. For further information follow the links to the relevant sections within the website. Sharjah Art Foundation presents a year-round programme of exhibitions and events featuring the work of local, regional and international artists. Past exhibitions have included solo presentations of work by artists such as Rasheed Araeen, Susan Hefuna, Lara Favaretto, Abdullah Al Saadi and Wael Shawky. These exhibitions are accompanied by related education and public programmes as well as visits organised for a wide range of community groups and schools. The Sharjah Art Foundation Collection is focused on the collection and presentation of work commissioned for or exhibited in the Biennial or other SAF projects. While international in scope, the Collection holds a substantial number of works by regional artists. Recognising the central role art can play in the life of a community, the SAF Education Programme offers a range of classes, workshops, lectures and activities for participants of all ages and abilities. The Education Programme focuses on building recognition of the central role art can play in the life of a community by promoting public learning and engagement while encouraging creativity and a participatory approach to art. Reflecting the growing importance of film in the Foundation’s work, the SAF Film Programme features regular film screenings in the outdoor Mirage City Cinema, a Film Club, educational programmes for film enthusiasts, as well as support for films and filmic work by visual artists. Over the years, SAF has worked with both musicians and artists on projects that include concerts, special commissions, sound works, international presentations and music programmes for Sharjah Biennials. The new SAF Music Programme will continue to develop this area of work. An ongoing Web Radio programme presents weekly podcasts that explore classical Arabic music. SAF supports the work of artists and art practitioners through a range of Artist and Professional Programmes that include the Production Programme Grants, Residencies, the March Project, professional training programmes, studio spaces and internship opportunities. Engagement with SAF’s local community is central to the Foundation’s mission. Alongside ongoing outreach events, activities and tours, are initiatives such as the Urban Garden and the annual Vantage Point Sharjah exhibition.